In a little over two months time the 2018 IAA Commercial Vehicle Show will take place in Hannover, and for German based global manufacturer MAN Truck & Bus it intends to exhibit an exciting range of new and improved products and services at the shared Volkswagen Truck & Bus Group stand. Last week MAN presented the trade media with a taste of what will be seen at the event. Using the almost constructed BrandenburgAirport in Berlin as a backdrop, a series of workshops were hosted and some new, improved models were displayed and available to test drive. 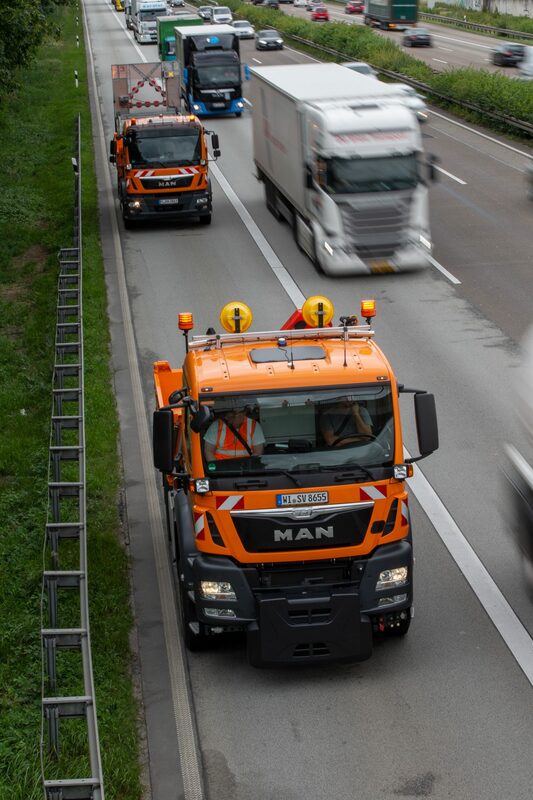 MAN is successful at engaging with its customers in terms of preparation for the new environment that they will find themselves in the next decade, in particular with the advent of autonomous driving and electrification. Neither electromobility nor driverless trucks or buses will appear overnight to any bus or truck operator. There will be an extensive lead in time and MAN is already well prepared to offer the advice consultancy needed. In the transition, MAN customers will be able to access the RIO digital and connectivity systems to manage all parts of their operations, including vehicles from other manufacturers. Once an operator has built the foundations for this specialized system, in general there is no shortage of electric equipment. On display was a MAN concept TGM electric powered truck which will start extensive live trials in Austria later in the year, with serial production of the zero emission distribution tractor-unit commencing in 2021. On the company’s bus side, the Lions’ City bus is on “live” trial at the moment and serial production will commence in 2020. Having entered the light commercial sector recently the new TGE van will also be offered as an electric option in the near future. One of the most innovative demonstrations was the Platooning operation, which will in the future allow a number of trucks to be driven in a tight convoy with just one driver and five trucks following. Currently field trials are taking place in partnership with German freight forwarder, DB Schenker.Each night, two trucks run as a platoon between the cities of Munich and Nuremberg in a trunking type operation. According to MAN engineers, the primary purpose of the test is to gather information for future development. Using the taxi ways at BrandenburgAirport, the press got a flavour of what will be possible in the not too distant future.